*Nolaney (adj. ): Characteristic of a work of fiction written by a Nolan brother. Most notable qualities include: stories involving regret and mystery over dead wives told in a nonlinear way with 11th-hour plot reveals that somehow don’t distract from the heart of the story unless you think about it too hard. Most of “Vanishing Point” focused on William and Emily, both through flashbacks and present day. As Emily tends to Williams wounds, we flashback to a gala event where William is bored, Juliette is drunk, and Emily is late. When she finally arrives, William mutters “Save me,” and the writers quickly establish that Emily had very much been “daddy’s little girl.” After William takes Juliette home for the evening, Emily witnesses a nasty fight between her parents in which Juliette accuses William of not just being a liar, but a complete lie. Emily doesn’t believe her and convinces her dad to have Juliette taken to rehab against her will. And here’s where it gets Nolaney: as William and Emily discuss Juliette’s rehab, a single drop of water falls onto the table. It’s a haunting moment in a devastating slow-motion sequence as William runs up the stairs and finds his wife dead in the tub. 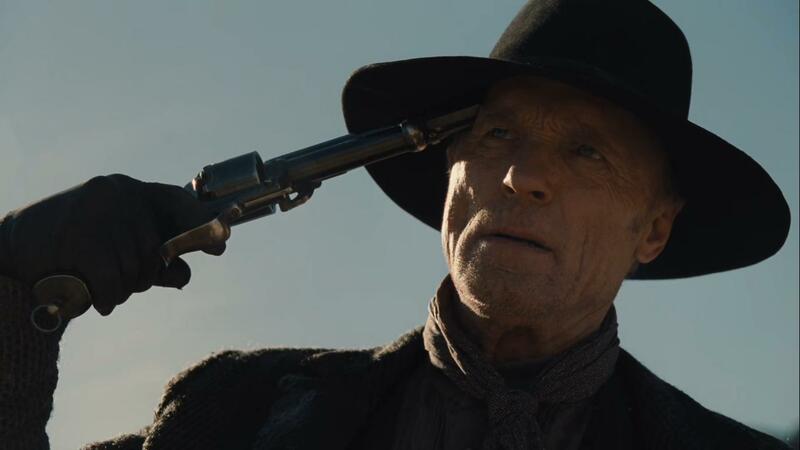 Present day in Westworld, William and Emily still deal with the ramifications of Juliette’s suicide. Emily still blames herself and finally reveals the reason she came to Westworld: she wants in on the Delos project to ask a host version of her mother why she killed herself. Emily never understood what drove her mother to end her life that night. William finally reveals that Juliette had learned the truth about him that night. At her bedside, William admitted that he doesn’t belong here in the real world. That the “Man in Black” is the person he truly is. This is a singular monologue at the end of the episode, but the ramifications cannot be overlooked. This is Williams full arc. The fulfillment of Logan’s promise that Westworld would show William who he truly is. For years he played the classic “nice guy” – even going so far as to interrogate Delores outside of the park to convince himself that she wasn’t real and he was delusional for loving her. Yet William knew there was a stain underneath the whole time. After all the things we’ve seen William do in the park, it is an enormous character moment for William to admit that the man in the black hat is who he really is. He believes this stain was in his nature. That it was there all along. As if something in nature hat programmed him to be that way. Back in the present, William apparently snaps after being forced to relive the painful memories of his wife’s suicide. He doesn’t believe Emily is real and thinks the whole thing to be part of Ford’s elaborate game. When Westworld security arrives to bring him in, William guns them all down, leaving a horrified Emily to try and convince him that those were real people, and she’s a real person, too. He shoots her anyway. This is where the layers of themes in Westworld stack up in a very human way. William is so detached from reality, so caught up in Ford’s game, he’s able to disassociate enough to shoot his own daughter. How can he be so sure? How can the lines of reality be so burred for him that he could kill his own daughter? Even if he believes her to be a host, shouldn’t it be slightly difficult for him to shoot such a lifelike resemblance of his daughter? Of course, he quickly realizes he’s made a mistake but can’t bring himself to end his own life. Instead, he cuts away at his own arm to see if he is a host. We’ll have to wait until next week to find out what he discovers, leaving us to sit within William’s mindset. He can’t tell reality from fiction anymore – but if you can’t tell, does it matter? William seems to have finally come around to the idea that it matters very much. Perhaps he wants to be a host at this point. He feels like he belongs in Westworld anyway, and after such a grave mistake, it would be nice to be able to blame such a horrendous act on programming rather than choice. But don’t we as humans do that anyway? How much do we blame on nature? Are we the summation of our choices or is there something inside of us, that “stain” that William refers to, that was there all along? And yet there’s still the possibility that Emily was a host all along. Westworld has come around from a nonlinear, sometimes convoluted season to give emotional weight to the theories and the speculation. Whether or not Emily was a host is now of grave importance to William’s character. This isn’t a game anymore – both for William and perhaps more importantly for those of us watching who get so caught up in theorizing we miss the emotional core of the characters. Now I finally care whether or not either of them is a host.